I am writing some T-SQL code for one of the assignments and am told to watch out for SQL injection as a possible attack vector. So I took a look around to see what it is and how it really works from a very high level. A good resource to start with SQL Injection (for that matter any attack) is the OWASP. As you see I do not do anything fancy. The Stored procedure takes some parameters and then constructs a sql statement, @SQL which is then executed. Look at the query that the SP tried to execute (that’s why I used the Print statement in the stored procedure code). 1. The Stored procedure is NOT validating the inputs. Well that is not what the SP is supposed to do. This is a very very very simple scenario and hopefully all the smart developers out there are not writing code like this in there Stored Procedures. But since I just started and it took me a while to get my query going, I thought of putting this here for reference. I will comeback to this with more tricky cases. Till then its Happy Learning to me!! 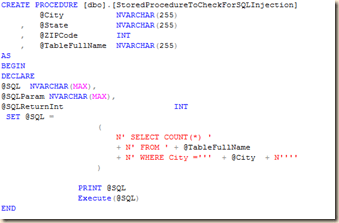 Next Post SQL Injection Mitigations – Is SP_EXECUTESQL enough?